The Mobile Robot Laboratory at Georgia Tech is pleased to announce the release of MissionLab v7.0 multiagent robotics mission specification and control software. 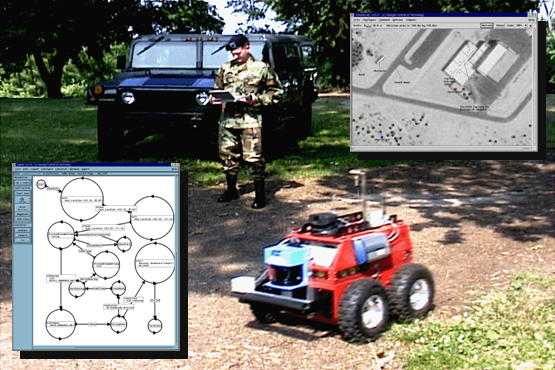 MissionLab takes high-level military-style plans and executes them with teams of real or simulated robotic vehicles. MissionLab supports execution of multiple robots both in simulation and actual robotics platforms, including device drivers for controlling iRobot's ATRV-Jr and Urban Robot, ActivMedia's AmigoBot and Pioneer AT, and Nomadics Technologies' Nomad 150 & 200. Each vehicle executes its portion of the mission using reactive control techniques developed here at Georgia Tech. Communication sensitive behaviors (communication recovery, communication preservation, and internalized plan) were implemented. HServer's localization capability was improved by incorporating probabilistic sensor fusion methods (Extended Kalman Filter, Particle Filter, etc.). An auction-based task allocation algorithm (Contract-Net Protocol) was integrated into the CBR Wizard in order to improve the multirobot mission specification process. A script-based mission management mechanism (CMDLi), which enables coordination of heterogeneous robots launched from heterogeneous software platforms (Georgia Tech's MissionLab, UPenn's ROCI, and USC's Player/Stage), has been integrated. CBR Wizard's automated mission repair mechanism has been integrated. mlab now supports OpenGL 3D graphic display. MissionLab can be now compiled with gcc 4.1. The installation steps have been greatly improved. MissionLab compiles and runs on Linux. In particular, we have successfully compiled and tested with the following systems. For more information regarding the requirements, please see notes in README.COMPILE. MissionLab is being developed at the Mobile Robot Laboratory at Georgia Tech under the direction of Professor Ronald Arkin. MissionLab distribution includes unsupported source code. Please feel free to download it and send any feedback to mlab‍@‍cc.‍gatech.‍edu.